Closed cell EPDM rubber sponge. Low sulfer content and Declining significantly metal corrosion. Noncombustibility and heat resistant. Color is black. 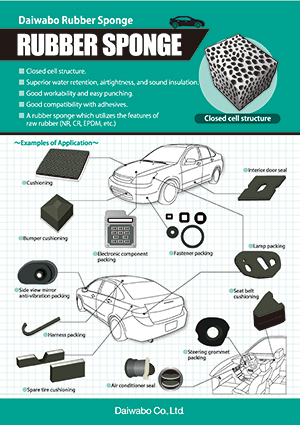 Eco-friendly closed cell structure. EPDM rubber sponge. Low density and hardness. VOC. A bicomponent fiber with the gluing thermal bonding tenacity which is excellent in the heat workability. Halogen-free, plasticizer-free and highly tear resistant. Special PVC tarpaulin with lower emission volume of CO2 and HCL when burnt. PVC laminated polyester filament woven fabric. Glass beads contained, high reflexivity and flexible retroreflective tarpaulin. High light shielding property prevents the excessive temperature rise and double side printable tarpaulin. The truck seat place the durability was light-weight and where was also raised 150 %. There are also few joints at 203 cm of margin. Non-PVC and halogen-free curing mesh sheet with no dioxin when burnt. Copyright© 2004-2015 Daiwabo Co., Ltd. All Rights Reserved.